Normally, I’m pretty worthless when I’m super hungry. I get irritable and irrational. I’ll yell, I’ll whine, I’ll pout, I may even cry. Yes, toddler-style. What can I say? It’s not my best trait. Once in a while, though, I’ll surprise myself (and my boyfriend) by behaving like a big girl long enough to push past the hunger and throw something together that makes everything okay. I’ll see the one last peach perched on the counter, the nub of goat cheese in the fridge, and remember the garden full of lettuce and herbs. Suddenly, I realize the crisis can be averted–I can make something out of this! 15 minutes later, I’ll be backing myself out of the crazy-losing-my-mind-from-hunger zone, and congratulating myself on turning a bad situation into a delicious one. Then I’ll get so excited over how yummy it was that I’ll make it all over again the next day so I can take pictures and talk about it here. Okay…now that you decided I’ve totally lost it, allow me to share my latest effort. 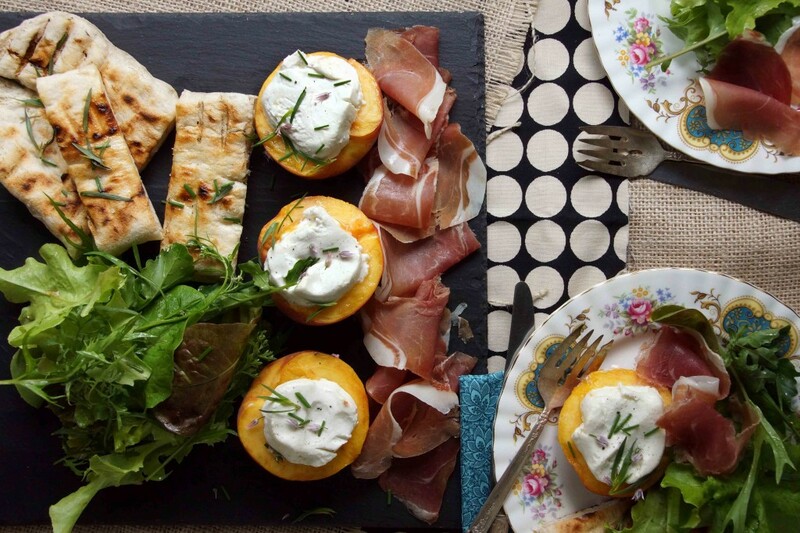 It’s a grilled or roasted peach stuffed with goat cheese, paired up with lettuce and herbs from the garden and a few slices of prosciutto. It’s awfully good and can be assembled in minutes. It’s the kind of thing that’s always a winner, on occasion, a savior, and just what I feel like eating all summer long. I know it’s summer when my food brain can’t dream beyond salads. Or grilling. Or grilled salads. Yes, indeed, summer is here and I am in the zone–let’s make something tasty. To pass as dinner, a salad has got to have a lot going on: contrasting textures, bold flavors, vibrant colors. You want it to taste light and summery but be filling and satisfying enough to keep you from devouring a pint of ice cream later in the evening. Ideally, it’s a salad that packs well so you can whisk it off to a park for an impromptu picnic or bring it to a potluck and be the girl/guy who brought that salad. It’s a tall order, but this salad is up for a challenge. It’s got it’s bases covered–a hearty, nutty mix of farro and chickpeas tossed with tons of grilled zucchini and red onions, dressed for summer with fresh oregano from the garden, lemon, and red pepper. 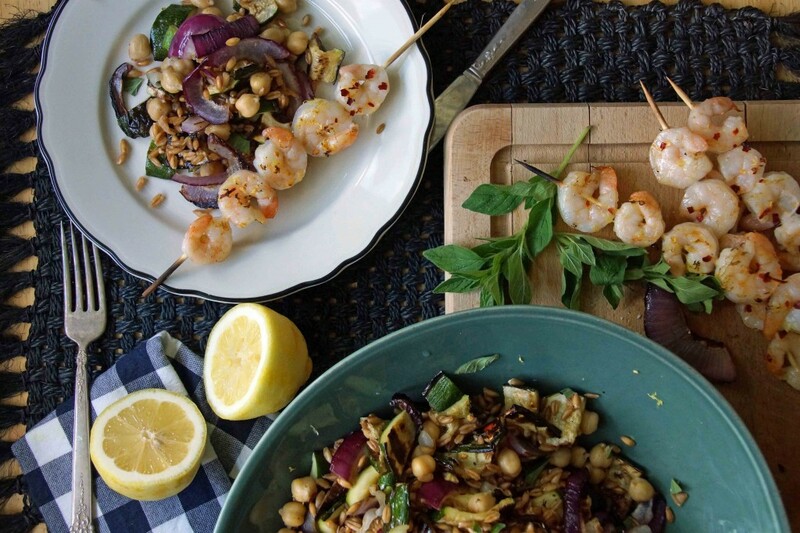 The addition of grilled shrimp skewers transform it from “lunchbox” to “maybe we should open a bottle of wine”. Perfect. This spring, as soon as fresh apricots made an appearance at the grocery store, I made a salad with them and the first sprigs of tarragon from my garden. The combination was good, day-dreamy good, and my mind wandered to familiar territory: butter, baking, and scones. 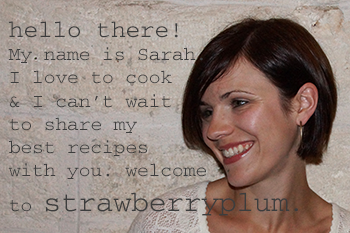 Do you remember a few weeks back when I shared an apricot and strawberry cobbler with you? I told you how the apricots had actually been meant for a batch of scones but (because life happens) they wound up in a cobbler instead. Don’t get me wrong, that cobbler was outstanding and if you haven’t tried it yet, or at least tried the combination of apricots and strawberries, you should. Now. 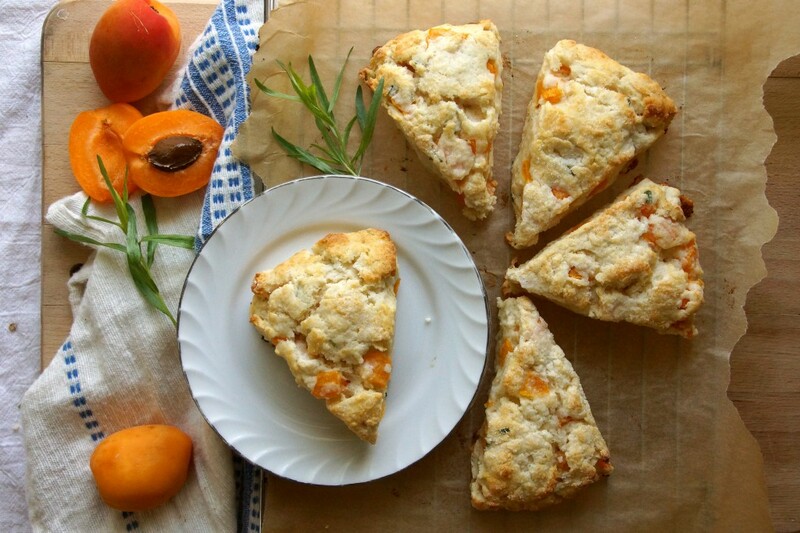 Just because those apricots became a cobbler doesn’t mean I gave up on my dream of fresh apricot scones. I finally got to them and they were as good in my real world as they were in my day-dreamy fantasy world. Buttery baked goods and ripe stone fruits are always a winning combination in my book (uh, peach pie anyone?) and the presence of tarragon adds an air of intrigue. This was an idea that started as a salad, grew butterfly wings, and transformed into something magical. 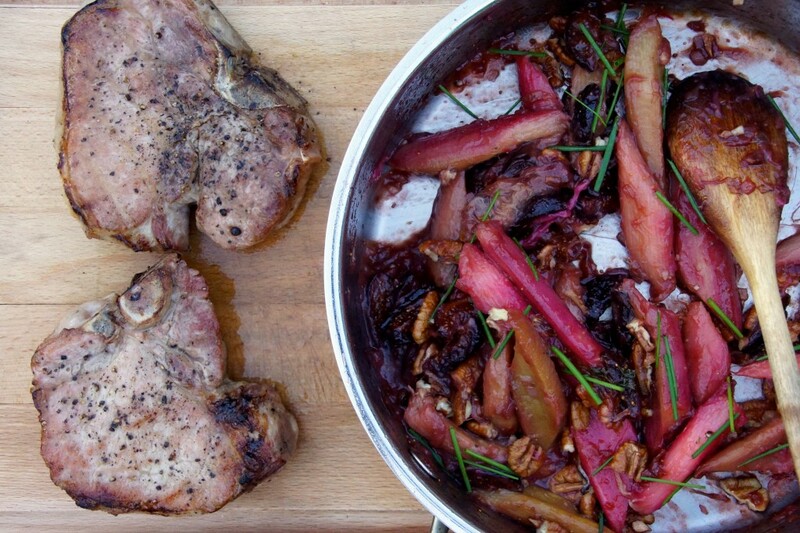 On the first go around, the idea was very vague–“hmm…pork would taste good with rhubarb and dried fruit”. I pounded out pieces of pork tenderloin, gave them a quick sear, and topped them with an arugula salad dressed with a rhubarb vinaigrette and a smattering of dried figs and pecans. The flavors were good but it just didn’t pack as much punch as I’d imagined. I wanted amazing, not meh. Thankfully, I spotted a recipe on another food website that made me decide to give these ingredients a second shot together. It was lamb chops with rhubarb-raisin agrodoloce. Excellent, it was basically the flavors I had imagined working so well together made into a dish that made more sense. I combined my ingredients list with the method used in the recipe and came out with a winner. Meh? No way! I got the “amazing” I’d been after.